Auditor, L. Inn 1503, pens. 1507, butler 1507-8, marshal 1510-11, gov. 1511-12, 1514-15, Autumn reader 1511, Lent 1515. Speaker of House of Commons 1523. Now you of this Commons House may report what you have seen and heard, and then all men shall openly perceive that the King hath not attempted this matter of will or pleasure, as some strangers report, but only for the discharge of his conscience and surety of the succession of his realm. 1. W. Roper, Life of More (EETS cxcvii), 7. 2. City of London RO, Guildhall, jnl. 11, f. 93. 3. Born on Friday, 7 Feb. in the regnal year 17 Edw. IV (mar. 1477-Mar. 1478), N. Harpsfield, Life of More (EETS clxxxvi), 298-303, but in 1478 the 7th was a Saturday, in 1477 Friday. Roper, 5-7, 105-10, 124; Emden, Biog. Reg. Univ. Oxf. to 1500, pp. 1305-8; Vis. Essex (Harl. Soc. xiv), 566; LP Hen. VIII, iii; PCC 24 Jankyn; J. 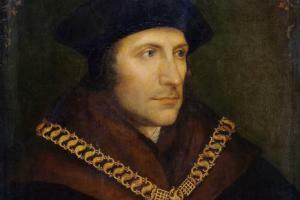 B. Trapp and H. S. HerbrÃ¼ggan, ‘The King’s Good Servant’ Sir thomas More (National Portrait Gallery 1977-78), passim; DNB. 5. Trapp and HerbrÃ¼ggan, 139; M. Hastings, ‘The Ancestry of Sir Thomas More’, Guildhall Misc. ii. 47-62; Roper, 6. 6. Roper, 7; R. W. Chambers, Thomas More, 98. 7. City of London RO, rep. 1, f. 148; 3, f. 156v; jnl. 11, ff. 32, 93, 124; Acts Ct. of Mercers’ Co. ed. Lyell and Watney, 320, 329-35; Richard Hill’s Commonplace Bk. (EETS ci), 156. 8. LJ, i. 14, 30; City of London RO, rep. 2, ff. 113, 146, 148; 3, f. 22; 4, f. 109v; P. H. Hogrefe, ‘Sir thomas More and Doctors’ Commons’, Moreana, xiv. 15-21; Roper, 9; LP Hen. VIII, ii, iv; Elton, ‘Thomas More, Councillor’, Studies in Tudor and Stuart Pol. and Govt. i. 130-3; Harpsfield, 319. 9. Elton, 129-54; LP Hen. VIII, iii, iv; Tudor Studies, ed. Seton-Watson, 257-86; Roper, 17-19; Hall, Chron. 655-7; R. L. Woods, ‘Pol. and precedent: Wolsy’s Parlt. of 1523’, HL Quarterly, xl. 297-312; A. F. Pollard, Evolution of Parlt. 382. 10. LP Hen. VIII, iv; J. S. Roskell, The Commons and their Speakers, 1376-1523, p. viii. 11. Lehmberg, 28-30; LP Hen. VIII, ix, 1077 citing SP1/99, p. 234; Elton, ‘Sir Thomas More and the opposition to Hen. VIII’, Studies, i. 155-72. 12. LP Hen. VIII, iv, v; Roper, 51, 53. 13. Roper, 53, 69; LP Hen. VIII, iii, vi-viii; A. Neame, The Holy Maid of Kent, passim. 14. G. de C. Parimiter, ‘Tudor indictments, illustrated by the indictment of St. Thomas More’, Recusant Hist. vi. 141-56; ‘A note on some aspects of the royal supremacy’, ibid. x. 183-92; J.D.M. 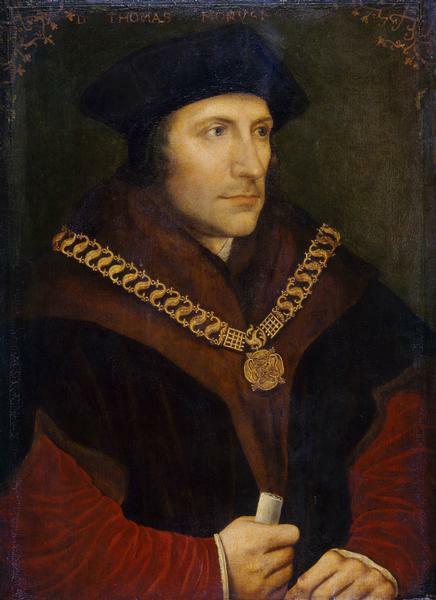 Derrett, ‘The trial of Sir Thomas More’, EHR, lxxix. 449-77; Roper, 86-96, 101-3; LP Hen. VIII, viii. 15. Trapp and Herbrüggan, 128; Derrett, ‘More’s conveyance’, Moreana, v. 19-26; Harpsfield, 212, 356.